Begin by speaking to Radimus Erkle in a small shack in the Legends' Guild. Note: For the skill requirements, you can use items which boost your skill level for a short time to complete this quest when you don't meet the requirements. See the appropriate skill guide for ways to boost your level temporarily. First, enter the gates of the Legend's Guild, and speak to Sir Radimus Erkle in the small shack left of the doors. You can find some Papyrus on the table, as well a a Machete in the cupboard. You will be given 3 tasks: Map the Khazari Jungle, befriend the Natives and bring back a token of their friendship. He will also give you some Radimus notes. Take three pieces of Papyrus, some Charcoal, a Machete and a Rune Axe, and your Radimus Notes, and head to the Khazari Jungle, south of Shilo Village. Speak to one of the Jungle Foresters near the Jungle Wall. He'll tell you he'll give you a special item, if you show him something 'impressive'. Enter the jungle by cutting yourself a way through the Jungle Wall, with your Machete and Axe. You have to map the West, Central and East Jungle. Walk around, going to each part, and clicking 'Complete Radimus Notes' once you're in a certain part, until you mapped all three parts. Bring the map back to the Jungle Forester.The Jungle Forester will give you a Bull Roarer, which you'll need along your quest. Try out your brand-new Bull Roarer, somewhere in the Jungle. Be careful, as it may attract Jungle Wolves and Jungle Savages! After a little while, Gujuo will appear. Show your good mood and be friendly to him. He says that he needs help to save one of his friends, Ugandulu. Go west along the Jungle Wall, until you find three rocks, which you can 'search'. They are located at the number 2 point on the above map. 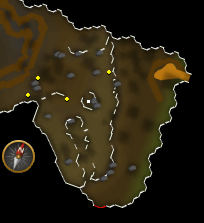 Search them, and try to squeeze through (50 Agility needed). You'll be in a cave with a Fire Wall, and in the middle will be Ugandulu. Investigate the Fire Wall and speak to Ugandulu, who will tell you that only Holy Water will extinguish the flames. Leave the cave and call for Gujuo again. Gujuo will tell you that only a bowl made from the 'Metal of the Sun' will hold the Holy Water, and he will give you a sketch of the bowl. Head out of the Khazari Jungle, bank in Shilo Village and take a few gold bars, along with a hammer, and head to a nearby anvil. There's one in the northern part of Tai Bwo Wannai. Use two gold bars with the anvil (50 Smithing required) and make a Golden Bowl (this can fail). Go back to the bank and get a Lockpick or two, Pickaxe, SMELL runes (1 Soul, 1 Mind, 1 Earth and 2 Law) and the 7 gems. Don't forget your Axe, Machete, Map and food! You may also want to bring along 1-2 Prayer Potions for the enchantment too, as it's possible to fail (and have your prayer drained). Now, go to the Holy Water Pool, located in the central section of the Khazari Jungle. Look on the map to find out where it is. There are tall reeds near the Pool, so use your Machete on them to get a Hollow Reed (this is not rare!). Use this reed on the Pool to fill your bowl. After that, the Reed becomes unusable and will be tossed away. Do not try to leave the Jungle with the Holy Water, or it will be gone! Before you head back to the the cave with flames, signal Gujuo with the Bull Roarer. He will congratulate you on getting the Gold Bowl filled with Pure Water. Ask him to enchant your bowl, but make sure you have 42 Prayer points! Otherwise, Gujuo will not enchant till then. Note: It's possible that the enchantment will fail, and your prayer will be drained. If your prayer isn't high enough, you won't be able to have the bowl enchanted. Once you have the Pure Water enchanted to Holy Water, return to the cave and use the Holy Water on the Fire Wall. You will be able to walk through the fire now without being damaged. Now, inside the Fire Wall ( or Fire Ring), search the desk to find a fairly heavy book more on Ugandulu. Read the book, then speak to Ugandulu. He will seem to change before your very eyes and cast a spell on you that hits up to 50 damage. 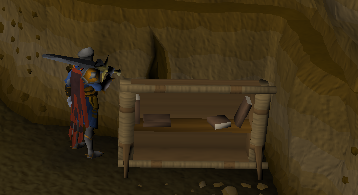 Look for a Bookcase with a hole behind it, on the northern wall, and search it. You'll eventually manage to squeeze through. Continue along the path and you'll see a large Ancient Gate. Use your Picklock with it, and you'll unlock it (50 Thieving required). Next, you'll see three Boulders on your path. Crush each of them with your Pickaxe (52 Mining required) and continue. 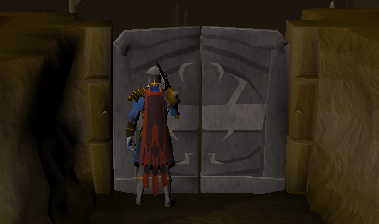 You'll see a Black Gate; you have to use your Strength (50) to open them. You may fail and temporary loose some strength levels. Run south past the level 110 Deathwings and you should find a Jagged Wall. Jump over it and continue along the passage, until you find a Marked Wall on your left. Search it, and you will find a riddle; you have to place the SMELL runes in the correct order on the wall, which is: Soul, Mind, Earth, Law, Law. Common Sense. This only needs to be done once. You'll be in a room with water pools and stalagmites now; place your gems on the stalagmites. Once you've placed a gem correctly, it disappears from your inventory. Just try until you've got them all right. You'll be lifted into the center of the cave, and you'll receive a Book of Binding. With this book, you'll learn how to defeat demons, and how to make Holy Water Vials. To make Holy Water Vials, you'll have to fill a vial with Holy Water, and enchant them by clicking 'Activus' on the last page of your book, or you can right-click it to enchant multiple vials at once. Blessing vials will drain your Prayer and Magic. Once you've blessed them, they can be wielded as a stackable Ranging weapon, and are ready to be thrown at demons. You do not have to make them, most people skip this because they prefer to smash up demons from nearby. Prepare for battle! If you want to have Holy Water Vials, make them now, because after you defeat the first form of the demon you'll face, the Holy Water Pool will become contaminated, making it unusable. Head out of the caves. Grab Prayer Potions, food, armour and weapons from the bank, and head back to Ugandulu. Use some Holy Water from your bowl on the Fire Wall to walk through. 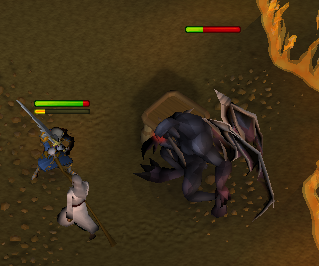 Use the Book of Binding on Ugandulu, and a level 120 Black Demon will appear; Nezickchened, your enemy during your quest. He'll drain your Prayer, so quickly drink a Prayer Potion and turn on Protect from Melee. He's a piece of cake to defeat. When he dies, you will take some damage - like with the Retribution Prayer. Talk to Ugandulu again. He will thank you and give you some Yommi Tree Seeds. Exit the cave and use the holy water on the Yommi Tree seeds. Then try getting more holy water from the pool. The water is now contaminated, so bull-roar for Gujuo and ask him what's happening with the water. He says you must go to the water source itself, and that you'll need a Bravery Potion before being able to go any deeper.Get some Snake Weed and Ardrigal and mix them into a vial to make a Bravery Potion. Snake Weed can be found southwest of the Tai Bwo Wannai village. Ardrigal can be found on a peninsula north of the harpie bug swarms. Consult the Jungle Potion quest guide for more help. Prepare to go deeper. Bring armor, weapons, potions, food, an uncharged orb, runes for any Charge Orb spell, a Rope, a Pickaxe, Lockpicks, Hatchet, Machete and Map. Bring around 6 Prayer potions and fill the rest with food. Be ready to take fight and take damage. Head back into the cave again, where you placed your gems. To the north of the room you'll find another Ancient Gate; search it for a riddle. 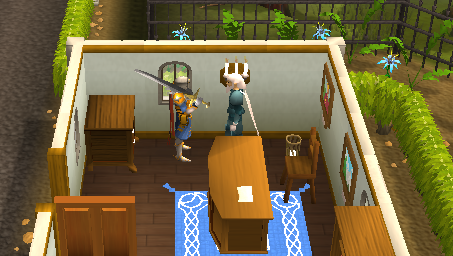 Cast a charge orb spell on it while holding an Uncharged Orb in your inventory; you'll be lifted straight through the door. You will need to cast the spell any time you enter through these doors. You will not need to, however, upon exiting. 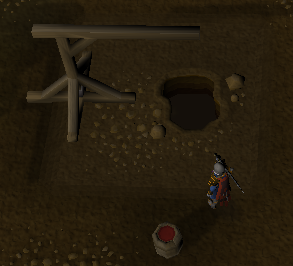 You are now in a room with a dark hole and a Winch; use your Rope on the Winch, drink your Bravery Potion and go down. You'll only need to drink the potion once and the rope will remain there for future use. You may fall down and take high damage. Try taking the Blue hat that lies on a ground and a ghost named Viyeldi will speak to you. Proceed down the cliff, climbing over the rocks as you go. 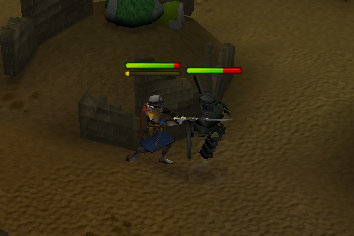 High agility is a great advantage and you can take a lot of damage here, so be prepared. You can also temporary loose some Agility levels if you fail obstacles. Once you're down, you have to beat the 3 Fallen Heroes, San Tojalon (level 100), Irvig Senay (level 100), and Ranalph Devere (level 90). Protect from melee is strongly recommended. You can also fight them using a Halberd or Range them, while hiding behind one of the many little walls, saving lots of Prayer potions. Each of the warriors will drop a Crystal Piece. Once you have all three pieces, use them on the furnace to the northeast to smelt them into a Crystal Heart. Then use the Crystal Heart on the Mossy Rock in the center of the room to get a Glowing Crystal Heart. 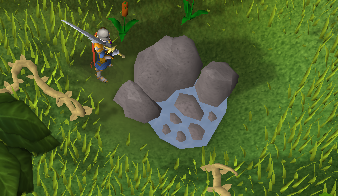 If you look at the minimap, you'll notice that the rock seems to be in the middle of an eye - the eye of a Dragon head! However, some people say it looks more like a dog. Now, the path splits: you have two choices, a shorter, evil, but more difficult one, and a longer, good, and easier one. If you choose the first option, you will have to fight the Fallen Heroes again in the last battle. Also, if you want to restock food and potions, the second path is the way to go. Go back to the Blue hat. Try taking it, and then use the dagger on Viyeldi. This will make the dagger glow. Take the dagger back to Echned Zekin, who will show you his true form: he is the black demon Nezikchened! As soon as you get the dagger, take it to Ugandulu and he will give you a Holy Spell. Make sure you do not stab Viyeldi with the dagger! 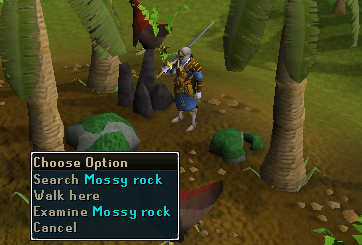 Go back out of the Jungle, and restock food and potions, and bring more Charge Orb runes and another Uncharged Orb. Go back down the caves to the Boulder and try to push it again. Echned Zekin will appear and he will be angry. Cast the Holy Spell and he will turn into Nezikchened! As soon as the Demon appears, he will drain your Prayer again. Drink a Prayer potion and turn on protect from melee again. He may throw a dagger at you, causing a lot of damage. Some food is enough to heal from that. Again, this demon is quite easy to defeat. Once you've defeated him, get out of the caves. If you climb back up the rocks on the small path, you'll only have a very small chance to fail, so don't worry about the return journey. Bull-roar for Gujuo, and tell him the good news. 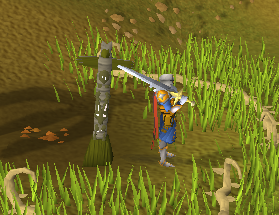 Now it's time to plant your Yommi Tree (45 Herblore needed)! Germinate the seeds by using some Holy Water on them. Before you plant them, make sure you have some more Holy Water in your bowl, along with your Axe. Now look for Fertile Soil: those dots you can see on brown ground. Look on the map to find out where they are. Use your seeds with them to plant your tree! Immediately use some Holy Water on it to make it grow faster, and after it's grown, quickly use your Axe on it several times, before it rots. You'll end up with a totem pole. You're nearly there! Prepare for the final battle; get some more Prayer potions and food if you want to. Go to the eastern part of the Jungle and use your Totem with the Dark Totem. Nezikchened will appear! As soon as he's done with his speech, he'll drain your Prayer one last time. Quickly drink a Prayer potion, turn on protect from melee and fight him. He will only use melee. This demon is strong; have patience. If you took the shorter option before, you'll also have to defeat the Warriors again. Once he's defeated, he will say things like 'I'll be back' etc. You've heard that before, eh? 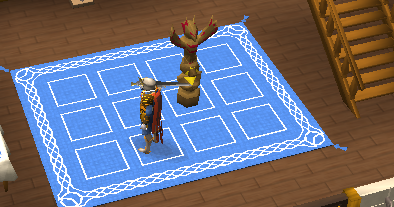 Use your Totem on the Dark Totem again, and Gujuo will appear and thank you. He offers you a Golden Totem! Yay! Head back to the Legend's Guild and give your Golden Totem and completed Notes to Sir Radimus Erkle. He will tell you to meet him in the main hall. Enter the gates and talk to him again. You can choose 4 of the skills that you can get 7,650 experience in, and you can spread it as you like. You can eventually earn 30,600 experience in a single skill, if you want to. Congratulations, you are now a Legend! Bull Roarer, Book of Binding and the Dark Dagger, if you got a second. 7,650 experience in the 4 skills of your choice - possible skills include Attack, Strength, Defence, Prayer, Magic, Constitution, Agility, Herblore, Thieving, Crafting, Mining, Smithing and Woodcutting. Access to the Kharazi Jungle without a map. Access to the Legends' Guild Store, where you can buy Mithril Seeds, the Right Half of the Dragon Shield, various Keys and other items. 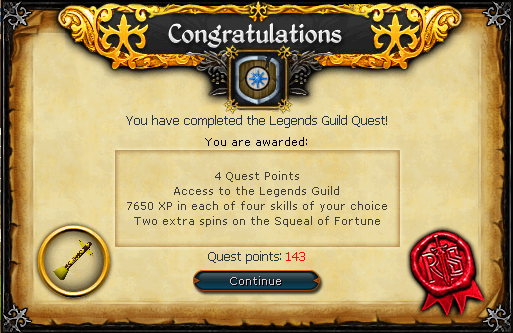 Access to the Legends' Guild. Ability to get your own Oomlie Wraps. Ability to smith Gold Bowls and make Holy Water Vials. Ability to buy a white Legends' Cape from the Legends' Guild and wear it. Ability to buy the Right Half of the Dragon Shield. Ability to wield the Dragon Shield. This food can be made by wrapping the meat of an Oomlie bird in a Palm Leaf to prevent burning it, and then cooking it. 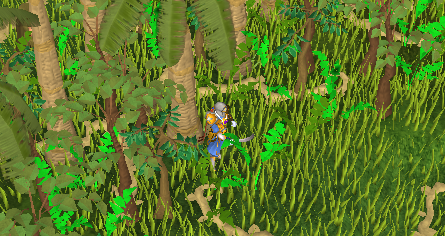 You can obtain Palm Leaves by shaking a tree near the Holy Water Pool in the Jungle. Cooking level 50 is required and it earns 40 Cooking experience. It heals 900 Life Points.